At a June 5 meeting of coca farmers in Cochabamba, Bolivian president Evo Morales threatened to expel the U.S. government's primary foreign assistance organization, USAID, from Bolivia. Morales accused USAID of lending financial support to organizations that oppose his government and for inciting civil unrest. On July 8, in a show of independence from foreign influence, the mayors of the northern Pando department expelled the agency from their territory, but to date, Morales' threats have not been carried out on a national level. The threat is perhaps less notable for its content than for its context. The announcement was made just days after Bolivian Foreign Minister David Choquehuanca met with U.S. Assistant Secretary of State for Western Hemisphere Affairs, Arturo Valenzuela, as part of ongoing talks aimed at reestablishing full diplomatic relations, after a damaging political dispute in 2008. Both men described the meeting as effective, and Choquehuanca proudly announced that “we have advanced more than 99% toward signing this new framework agreement of mutual respect.” However, Choquehuanca's glowing announcement was not accompanied by any formal agreement or concrete plans to reinstate ambassadors. In September of 2008, Morales accused the U.S. ambassador, Phillip Goldberg, of fomenting unrest after anti-government protests turned deadly. He expelled Goldberg along with officials of USAID and the Drug Enforcement Agency (DEA), which had been operating in the country for 35 years and was a key component of the U.S. War on Drugs. The Bush administration responded by expelling Bolivia's ambassador, Gustavo Guzmán, and suspended its cooperation with Bolivia under the Andean Trade Promotion and Drug Eradication Act (ATPDEA), ending the country's duty-free access to U.S. markets. Many international news outlets, however, have suggested that Morales's recent threats to expel USAID are in part a political ploy to restore domestic support for his administration. Many of Bolivia's ascendant indigenous organizations have grown increasingly critical of Morales's emphasis on revenue-generating extractive industries – natural gas in particular - which undermine his commitment to respect indigenous land rights and conservation. The June threats, they suggest, may be little more than an attempted rallying cry against a common imperial enemy, not unlike characterizations of Hugo Chávez. Despite their domestic political usefulness, Morales's accusations about USAID are not hollow and have been consistent since as early as 2006. The organization is notoriously evasive in response to requests for disclosure of the recipients of its political funding. The main website of USAID in Bolivia omits any direct mention of political programs, instead it emphasizes its support for the Bolivian government and its plans to “improve citizen access to health services and education and increase employment opportunities.” However, the budget request for 2009 tells a different story. Of the roughly $100 million requested, $46 million was slated to go to “Peace and Security” programs (which includes the ominous sub-program “Stabilization Operations and Security Sector Reform”) and over $28 million would go to “Governing Justly and Democratically” programs. In October 2008, Investigative journalist Jeremy Bigwood uncovered a memo from the U.S. Embassy in La Paz, detailing a USAID-funded “political party reform project [aimed] at implementing an existing Bolivian law that would . . . over the long run, help build moderate, pro-democracy political parties that can serve as a counterweight to the radical MAS [party of President Morales] or its successors.” The project is suspected to have funded groups that challenged Morales in his 2006 election and during the 2008 political crisis . The United States has shown no signs of reforming the organization, and has taken further steps that would seem to undermine reconciliation efforts with Bolivia. The nomination of Feierstein to head USAID's Latin American programs is itself something of a snub to the Bolivian President. Feierstein is the vice president of the powerful political consultancy firm Greenberg, Quinlan and Rosner (GQR), which was hired by former Bolivian president Gonzalo Sànchez de Lozada to consult on polling and strategy for his victorious 2002 presidential campaign. Lozada later resigned and fled to the United States in 2003 to evade possible prosecution for the murders of at least 60 protesters by troops under his command. 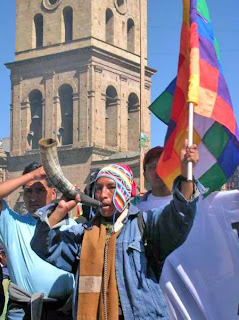 Calls for Lozada's extradition are widespread in Bolivia, and Morales has appealed to the U.S. government for support on multiple occasions, to no avail. The firm also conducted polling for right-wing presidential candidate Manfred Reyes Villa in his unsuccessful campaign against Morales in 2009. Feierstein’s nomination is highly controversial within Bolivia. Morales' threats to expel USAID and Obama's nomination of Feierstein undermine both countries’ stated commitment to reconciliation, reflecting a tense past rather than a more cooperative future. That the United States and Bolivia seem determined to keep trying, at least to some degree, suggests that the strategic value of each country to the other, despite continuing disagreements, should not be underestimated. Bolivia is estimated to have lost around 63 million dollars in manufacturing exports after Bush suspended it from ATPDEA, a significant loss it likely hopes to avoid in the future. And Bolivia's physical and political location amidst the constellation of coca producers and left-leaning governments in Latin America, makes it a critical – if often defiant – partner in the United States' nebulous war on drugs, now well into its fourth decade. Given the United States's past and ongoing manipulation of Bolivian politics with the help of USAID, and Bolivia's attempt to free itself of that organization's influence, it is not surprising that complete reconciliation has thus far remained elusive. Lisa Skeen is a NACLA Research Associate.